A wide variety of aquaria are now kept by hobbyists, ranging from a simple bowl housing a single fish to complex simulated ecosystems with carefully engineered support systems. Aquaria are usually classified as containing fresh water or salt water and brackish water, at tropical or cold water temperatures. These characteristics, and others, determine the type of fish and other inhabitants that can survive and thrive in the aquarium. Inhabitants for aquaria are often collected from the wild, although there is a growing list of organisms that are bred in captivity for supply to the aquarium trade. The keeping of fish in an aquarium first became a popular hobby in Britain only after ornate aquaria in cast-iron frames were featured at the Great Exhibition of 1851. The framed-glass aquarium was a specialized version of the glazed Wardian case developed for British horticulturists in the 1830s to protect exotic plants on long sea voyages. (One feature of some 19th century aquaria that would prove curious to hobbyists today was the use of a metal base panel so that the aquarium water could be heated by flame.) Germans rivaled the British in their interest, and by the turn of the century Hamburg became the European port of entry for many newly seen species. Aquaria became more widely popular as houses became almost universally electrified after World War I. With electricity great improvements were made in aquarium technology, allowing artificial lighting as well as the aeration, filtration, and heating of the water. Popularization was also assisted by the availability of air freight, which allowed a much wider variety of fish to be successfully imported from distant regions of origin that consequently attracted new hobbyists. 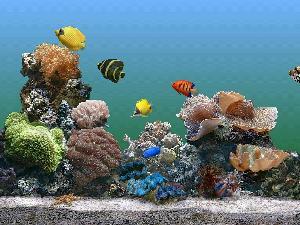 There are currently estimated to be about 60 million aquarium hobbyists worldwide, and many more aquaria kept by them. The hobby has the strongest following in Europe, Asia, and North America. In the United States, a large minority (40%) of aquarists maintain two or more tanks at any one time. The common freshwater aquarium maintained by a home aquarist typically includes a filtration system, an artificial lighting system, air pumps, and a heater. In addition, some freshwater tanks (and most saltwater tanks) use powerheads to increase water circulation. Combined biological and mechanical filtration systems are now common; these are designed to remove potentially dangerous build up of nitrogenous wastes and phosphates dissolved in the water, as well as particulate matter. Filtration systems are the most complexly engineered component of most home aquaria, and various designs are used. 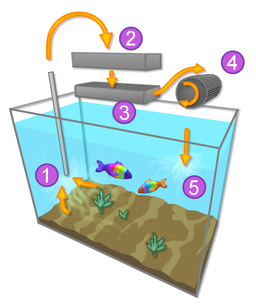 Most systems use pumps to remove a small portion of the tank's water to an external pathway where filtration occurs; the filtered water is then returned to the aquarium. Protein skimmers, filtration devices that remove proteins and other waste from the water, not only work in Marine aqauriums but also work in nutrient rich environments, but are made popular through the use of the Berlin System. Air pumps are employed to adequately oxygenate (or in the case of a heavily planted aquarium, provide carbon dioxide to) the water. These devices, once universal, are now somewhat less commonly used as some newer filtration systems create enough surface agitation to supply adequate gas exchange at the surface. Aquarium heaters are designed to act as thermostats to regulate water temperature at a level designated by the aquarist when the prevailing temperature of air surrounding the aquarium is below the desired water temperature. Coolers are also available for use in cold water aquaria or in parts of the world where the ambient room temperature is above the desired tank temperature. An aquarium's physical characteristics form another aspect of aquarium design. Size, lighting conditions, density of floating and rooted plants, placement of bogwood, creation of caves or overhangs, type of substrate, and other factors (including an aquarium's positioning within a room) can all affect the behavior and survivability of tank inhabitants. The combined function of these elements is to maintain appropriate water quality and characteristics suitable for the aquarium's residents. An aquarium can range from a small, unadorned glass bowl containing less than a litre of water - although generally unsuited for most fish - to immense tanks built in public aquaria which are limited only by engineering constraints and can house entire ecosystems as large as kelp forests or species of large sharks. In general, larger aquarium systems are typically recommended to hobbyists due to their resistance to rapid fluctuations of temperature and pH, allowing for greater system stability. Aquaria kept in homes by hobbyists can be as small as 3 U.S. gallons (11 L). This size is widely considered the smallest practical system with filtration and other basic systems; indeed, the local government of Rome, Italy, has recently taken the step of banning traditional goldfish bowls as inhumane. Practical limitations, most notably the weight (fresh water weighs about 8.3 pounds per U.S. gallon (1 kg/L), and salt water is even denser) and internal water pressure (requiring thick, strong glass siding) of a large aquarium, keep most home aquaria to a maximum of around 1 m? (300 U.S. gallons). However, some dedicated aquarists have been known to construct custom aquaria of up to several thousand U.S. gallons (several cubic meters), at great effort and expense. Public aquaria designed for exhibition of large species or environments can be dramatically larger than any home aquarium. The Shedd Aquarium features an individual aquarium of two million U.S. gallons (19,000 m? ), as well as two others of 400,000 U.S. gallons (1,500 m?). The Monterey Bay Aquarium has an acrylic viewing window into their largest tank. At 56 feet long by 17 feet high (17 by 5 m), it used to be the largest window in the world and is over 13 inches (330 mm) thick. The Okinawa Churaumi Aquarium is the world's second largest aquarium and part of the Ocean Expo Park (see Expo '75) located in Motobu, Okinawa. Its main tank, which holds 7,500 cubic meters of water, features the world's largest acrylic panel measuring 8.2 meters by 22.5 meters with a thickness of 60 centimeters. The size of public aquaria are usually limited by cost considerations.